In what probably signifies a new approach to achieving socio-economic development, a few policy makers and development agencies in developing countries are beginning to move from measuring success through the number of beneficiaries. Instead, they are reluctantly shifting to their focus to how the so-called beneficiaries mobilize and use knowledge associated with projects introduced in their communities. Attention is turning to several ways in which communities understand and use knowledge to increase their incomes and cope with challenges like climate variability and market failure. As part of forging a new deal with poor communities, financial institutions are also realizing the importance of understanding the potential of poor borrowers at a granular level. Otherwise, banks would continue ignoring poor people and continue giving money to those who do not really need it merely because they have collateral. There is increasing interest to know what knowledge exists in a particular community. What knowledge is coming into a community, what is going out and what is being shared to address socio-economic challenges? Many communities define economic knowledge through economic skills and livelihood activities such as commodity trading, retailing and converting natural resources into income. There are people who can use local resources like water, wood and land to produce excellent goods and services for the benefit of the entire community. On the other hand, social knowledge is about how community members make sense of their collective identity and preserve it. Also critical is political knowledge through which local people try to express, interpret and access their rights. This encompasses how local politics enhances community development and how community members deal with political conflicts. Political knowledge also extends to how communities deal with issues like domestic violence and managing collective resources. Additional ways in which knowledge is understood at local level include age, gender, location, economic status, level of education, cultural background and exposure to other communities, among other parameters. This means the knowledge landscape is experienced differently. Within each community are knowledge hubs and holders who include elders, chiefs, opinion leaders, artisans, spiritual leaders and others. These share knowledge at various levels such as household, community and district. One of the major reasons why development actors have remained obsessed with measuring success through the number of beneficiaries is that development support has for a long time been framed in social welfare terms characterized by hand-outs like food, clothes and small livestock. These have to be actually counted before being given out for free. Giving hand-outs is about numbers like kilograms of maize meal, litres of cooking oil, etc. When dealing with numbers, organizations are less concerned with return on investment (ROI) which is often difficult to measure. They are also not steered by sales or market share but budget allocation. Providing hundreds of tons of beans is considered more important than understanding whether recipients are going to eat the beans or not. Development actors also provide infrastructural benefits in the form of supporting government efforts, for instance, in dam construction and rehabilitating irrigation schemes. These are also other forms of hand- outs that are not being expressed through ROI. An important question is the extent to which communities cope with climate change using their own knowledge to improve livelihoods using established infrastructure. Since it is all about numbers, how do communities utilize their knowledge to maximize outcomes from the investments made by development partners? Most development actors are working in rural areas because they think they want to reduce poverty in rural areas. But rural areas a lot of knowledge which make them rich in their own ways. Before introducing a project, it is becoming very important for development agencies like NGOs, government departments and the private sector to understand how each community deals with knowledge. Within all versions of community knowledge are champions and knowledge pockets built within communities by age, among other connectors. What connects widows is not belonging to the same community but the fact that they share similar circumstances, experiences and passion. Focusing on community knowledge will ensure structures left when projects end are fully utilized. Investment in dams, boreholes, irrigation schemes or rehabilitation of roads through food for assets is not a complete value chain. Instead of positioning themselves in ways that complete the value chain, most development agencies and government departments duplicate each other. When farmers produce more commodities from all these assets, lack of investment in market infrastructure like warehousing and cooling facilities creates more challenges than solutions. In as much as investments by development agencies are social welfare, what part is knowledge? How can beneficiaries convert infrastructure investments into knowledge hubs for socio-economic development? It is no longer about the number of dams or irrigation schemes but the knowledge hubs for socio-economic development through infrastructure. It is also no longer about the number of people to benefit but knowledge to be generated through using the infrastructure and other resources like dams. In a changing climate, to what extent does knowledge and information on dams, boreholes and irrigation schemes assist communities in managing climate change? 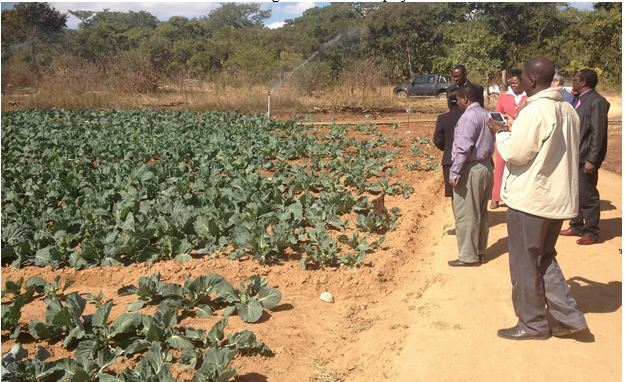 Investment in knowledge will enable local people to convert their natural resources into value added products. A community may benefit more from increasing the number of champions who can gather knowledge and evidence on production, consumer tastes, preferences and consumption patterns than from more dams and irrigation schemes. Every community should have structures built around knowledge experts embedded within diverse actors. If weather stations are set up within communities, information should be interpreted at local level through local champions. Otherwise it is just a weather station with no links to local socio-economic development. A community is just like a company with divisions or departments such as production, logistics, sales and marketing. All these departments should be visualized in communities and conceptualized into soft skills. Everybody has hard skills like production but soft skills and knowledge are scarce. Unfortunately, in most rural communities, knowledge remains trapped in silos with no clear pathways of knowledge sharing from rural to urban and regional levels. Without proper characterization of knowledge demand and supply pathways, it is easy to continue sending market information to livestock farmers when the farmers are taking livestock more as a store of value than a commodity to be sold any time. This entry was posted in agri-bussiness, Agricultural Intelligence, Agricultural Markets, eMKambo, www.grmining.co.zw and tagged grmining.co.zw. Bookmark the permalink. ← When will developing countries stop importing knowledge?